In 1995 the community of Walvis Bay realized that there was a need for a place for the physically and mentally challenged in the Erongo Region. A place that could take them in and help them cope better with their circumstances. 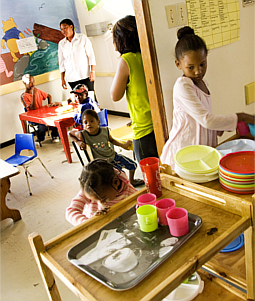 A survey was conducted and that is how Walvis Bay Child and Family Centre came into existence. The center was started by Elsa Murangi in 1995. It started off with 4 children, and has since grown to accommodate 108 people with different physical and mental challenges. The center deals with people with autism, down’s syndrome, cerebral palsy and different kinds of physical and mental disabilities. WBCFC is funded through donations and small self-initiatives. They also have a catering kitchen, and caters for two to three boats. This provides the center with cash flow that covers partial expenses. The work around the differently abled involves putting each person in a particular designated group. Those that are unable to attend school, receive training like gardening, needlework or woodwork. Those who cannot get a job are kept at the centre in sheltered employment. Those who were enrolled in school, but were unable to cope in school are put in a group, where the main emphasis is on stimulating them, so that they can be put back in school. It is the aim of the center to put them back into the society. The stimulation process might take one or two years, depending on how fast the child is progressing. Only after that will the child be introduced back into school.